Constructed of Billet Aluminum vs the stock plastic, eliminates timing variation under high RPM and load. Reduces flex for rock solid timing and consistent performance. Does not soften with heat. Works with all other factory and aftermarket components. Lifetime warranty against breakage. RED Anodized for wear and corrosion resistance. Replaceable wear strips (included as shown). Simply the strongest and most precise chain timing system possible. 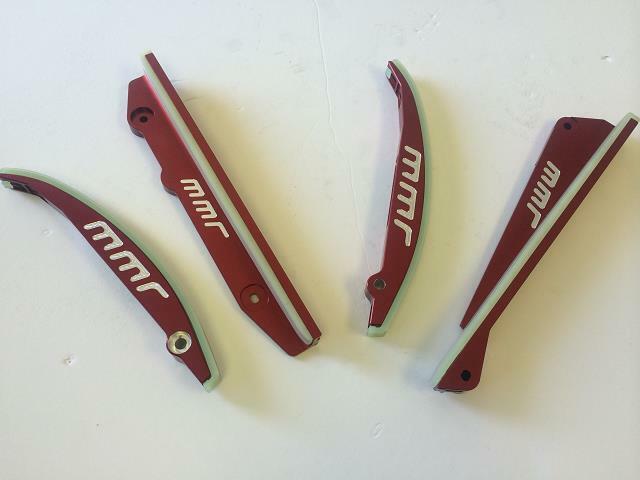 MMR Billet Guides are used by Mulitiple NMRA / NMCA Champions and are the the only complete set of Billet Chain guides tested into the 5 second zone by the MMR Raceteam!! Last edited by Mod Mustang Racing; 07-15-2016 at 04:13 PM.